The New Jerusalem Next Level Capital Campaign was introduced to us as a church body in 2016. At that time, we announced the future remodeling efforts for our edifice. Little did we know, — but we believed that when we announced the kick off of our Next Level Capital Campaign, that we would get off to such a great successful start and God would wrought a miracle! We’re thankful to all of you who gave. 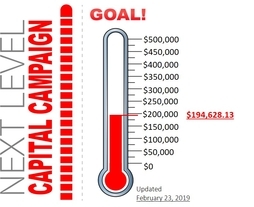 Now I’m asking those of you who have not pledged their commitment to our Next Level Capital Campaign, to commit as well to this $7,000,000 effort and let’s allow God to do through us what only God can do. The level of pledges are levels 1-6 which are above and beyond your tithes and systematic giving. I know that some would succeed this amount as God has blessed them to give more but ultimately each member is asked to give as God has blessed you. Each and every contribution is needed and appreciated “….” If we have faith as the grain of the mustard seed, ye shall say unto this mountain, remove hence go yonder place; and it shall be removed; and nothing shall be impossible unto you. The Bible declares in Habakkuk 2:2-3, “Write the vision and make it plain upon the tablets, that he may run that readeth it. For the vision is yet for an appointed time but at the end it shall speak, and not lie; though it tarry, wait for it, because it will surely come, it will not tarry.” In knowing this, it’s imperative that those of us who have not pledged toward our Next Level Capital Campaign, it is our prayer that you would catch and support the vision and pledge to give what God purposed in your heart.